The Winter Soldier brings important economic benefits and some temporary alternate traffic patterns too. CLEVELAND – This spring, Cleveland will once again be buzzing with excitement as it hosts super heroes and film crews. Partnering with the production company and the Greater Cleveland Film Commission on this film will help position Cleveland to become a location destination for the movie industry and in turn, support local businesses and create jobs for Cleveland area residents. But transforming the streets into a movie set will require some temporary road closures and alternate routes for motorists and pedestrians from May 18 through June 28, 2013 (weather permitting). City staff, including the Division of Traffic & Engineering and the Division of Police, Bureau of Traffic, have been working with the production company, traffic-engineering consultant American Roadway Logistics and GCRTA to develop a plan to accommodate the needs of the film and help keep traffic moving throughout the city as smoothly as possible. The production company will pay for additional Police Officers and Traffic Controllers to supplement the standard traffic detail for rush hours, special events and routine travel; and to ensure that the coordinated effort is effectively assisting traffic flow. Primary among the road closures and alternate routes will be Cleveland’s West Shoreway, which will be closed (east and west bound) from Lake Avenue to E. 9th Street from May 30th through June 14th. Edgewater Park and the marinas north of the Shoreway will be accessed via West 49th St. Vehicles exiting Edgewater Park and the marinas will be directed out through the closed Westbound lanes of the Shoreway back to West 49th Street. Other street closures and re-routing will occur in Downtown Cleveland, primarily between May 19th and June 14th. Additional closures may occur between June 14th and June 28th. Updates will be provided on a regular basis through additional traffic advisories, press releases and social media. Follow on Twitter via #CLECaptTraffic. You may also view a list of closures and reroutes at www.clevelandmovietraffic.com or listen to an automated list of street closures that will be updated on a weekly basis at 866-999-4959. Indians fans looking for information on the best ways to avoid limited road closures should visit ““Indians.com/planyourtrip”. Pedestrians in Downtown Cleveland can look for Downtown Cleveland Alliance Ambassadors’ yellow shirts. DCA Ambassadors will guide pedestrians and connect them to up-to-date information from officials. The following chart & map details the dates and locations of impact, as well as alternate routes and additional information as needed. This listing is subject to change. Various road closures may affect RTA customers. Please visit www.riderta.com or call the RTAnswerline at 216.621.9500 for all the details. For questions concerning the film Captain America, please contact the film’s publicist, John Pisani, at 310-727-2400 or email jmpmovie@aol.com. Rockwell AveBtw E9th St & West Mall Drive May 19 – May 25 Superior Ave. A lane will be maintained for parking garage access between E. 9th & E. 6th Streets. E6th StBtw Superior Ave & Euclid Ave May 20 Intermittent traffic control A lane will be maintained for access to the 515 Euclid garage. Garages Vincent Ave. have access via E. 9th St.
E6th St Between St. Clair Ave & Lakeside Ave May 23 E. 9th St. Access to parking garages will be maintained. Lakeside Ave Btw E9th St & East Mall Drive May 23 Intermittent traffic control Access to parking garages will be maintained. Euclid Ave Btw E6th & E18th St May 24 – 25 Superior Ave. Buses will be re-routed to Prospect. E. 9th St Btw Euclid Ave & Bolivar Ave May 24 – 25 E. 18th St. Prospect Ave Btw Ontario & E18th St May 24 – 25 Open for car traffic No parking on this street to allow for the rerouting of buses from Euclid Avenue. Prospect Ave Btw E2nd St & E17th St May 26 Superior Ave. Access to the Horseshoe Casino Parking Garage will be maintained. Huron Rd Between Ontario Ave & Prospect Ave May 26th, May 28 – June 1 Carnegie Ave. No through traffic. Access to parking garages and local businesses will be maintained. Bolivar Rd @ Prospect Ave May 26 Carnegie Ave. Access to Gateway East Garage will be maintained. Bolivar btw E9th St & Prospect Ave will be a 2 way street to allow traffic access and egress. Prospect Ave Btw E4th St & E17 th St May 28 – June 1Until 5pm Carnegie Ave. Access to parking garages will be maintained. Prospect Ave Btw E4th St & just West of Bolivar Ave May 28 – June 1After 5pm Carnegie Ave. Access to parking garages will be maintained. E. 9th St. Between Chester Ave & Bolivar Ave May 28 – June 1 Carnegie Ave. Access to parking garages will be maintained. 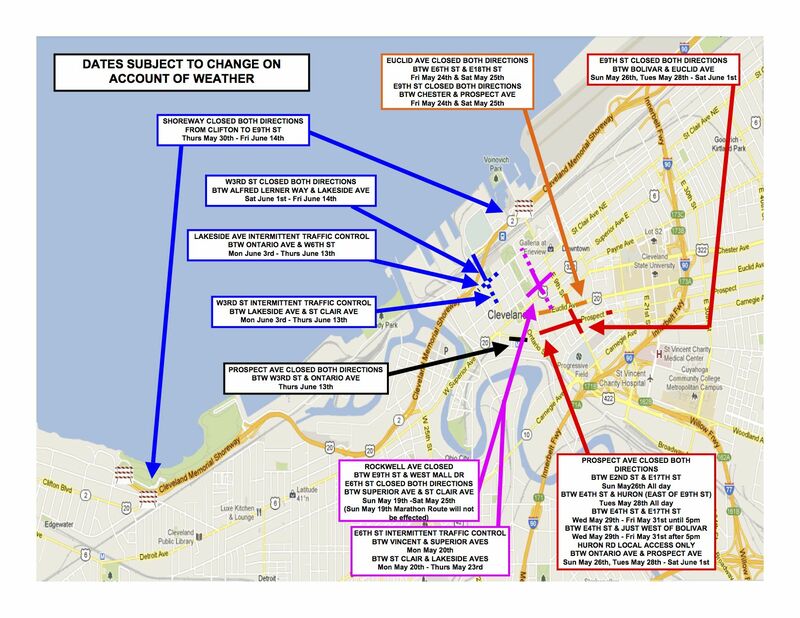 West Shoreway Between Lake Ave & E 9th St May 30 – June 14 Detroit Ave. Edgewater Park and the marinas north of the Shoreway will be accessed via West 49th St. Detroit Ave btw West Blvd & W25th St will be no parking rush hours to expedite traffic flow. W3rd St Btw Alfred Lerner Way & Lakeside Ave May 30 – June 14 E. 9th St. Access to Huntington Garage will be maintained off of Lakeside Ave. Prospect Ave. Btw W6th & Ontario Ave June 13 Intermittent traffic control Parking garage access will be maintained.